This forum is a place to post thoughts, papers and documents that show the need for an autocephalous, independent, self-governing Orthodox Church in the USA in which the Synod is composed of the bishops of all jurisdictions who meet to elect their own head, approve work of their committees and include the laity and the input of laypeople in the administration of the Church. The Church is governed to meet the spiritual needs of all Orthodox faithful in the geographic area of the USA and is a Mission Church welcoming all seekers and faithful who want to be part of the Apostolic Church. The Church is transparent, accountable and Christ-centered, governed by the clergy and laity in synergy with the Holy Spirit. 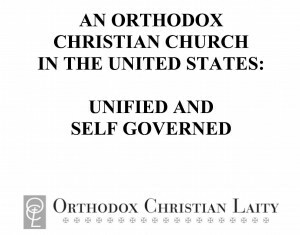 This first paper to be featured is An Orthodox Christian Church in the United States: Unified and Self Governed. It was published as an Occasional Paper by OCL in 2000 and was distributed throughout the Orthodox Communities. We are reintroducing it as part of this series, and we will publish new information and also search our archives for relevant material. Dealing with the symptoms without dealing with the disease is an exercise in futility. The Orthodox Churches have a disease. This disease is spiritual in nature. The disease is based in the almost total disconnect between the theology and spirituality of the Orthodox Faith and its practice by most Orthodox laypeople and the parish communities of which they are affiliated. Jesus Christ, His person and His Gospel is at the center of the Orthodox Christian Faith and yet, (and this comment is based upon 24 years of experience serving in Antiochian and OCA parishes, as well as serving as a visiting priest in many communities of the GOA) the “faithful” have little personal commitment to Jesus Christ and have “sold out” to secularism and ethno-centrism. I was told that Fr. Alexander Schmemann made the comment that Orthodoxy was the right Faith with the wrong people. I believe he was referring to the fact that the Orthodox Faith is claimed by thousands upon thousands of men and women who are more interested in the ethnic identities then in the Gospel of Jesus Christ. I have also been told that Fr. Alexander also opined that Evangelicals had the Head (Jesus Christ) without the Body (the Church) while the Orthodox have the Body (the Church) without the Head (Jesus Christ). Now I certainly aware that this statement is theologically problematic while at the same time expressing the “disease” of the Orthodox. In the 24 years I have served as a priest I have been vilified by parish council member after parish council member for being “too religious”, “too spiritual”, “too fixated on the Bible”, “too fixated on the Fathers”. I have over those 24 years subjected to the disapproval of lay parish leaders because I emphasized the liturgical and “sacramental” life of the Church, because I encouraged the practice of Confession, or fasting during the Fast periods of the Church, for supporting the Church through the scriptural methods of tithing and proportional giving and outreach to the neighbors who live around the Church building. In these cases I have been reminded that “this Church is for OUR people” and “we are giving as much to the Church as we possibly can”. Likewise in my 24 years of serving as a priest I have served under five different bishops. Only two of those five bishops ever supported me in my ministry to bring spiritual renewal to the parishes I served. One of those bishops actually removed from the parish I served because of the above complaints against me. I write of these experiences only to support my assertion that a canonically unified Orthodox Church in North America is not some sort of magic bullet to solve many of the problems that George Matsoukas claims it will solve in his article. Canonical Jurisdictional unity will NOT solve the “disease” that the Orthodox Churches in North America suffer from at this time. The only cure for that “disease” is an overall SPIRITUAL RENEWAL of the Orthodox people, beginning with the Metropolitans, Archbishops and Bishops on down to the Priests, Deacons, the Laymen and Laywomen and the Youth and Children of our parish communities. This will only happen when we recognize the ROOT of the problem, admit our spiritual malaise and respond to Jesus Christ by uniting ourselves to HIM, take up our Cross and follow HIM, and receive a renewed Baptism of the Holy Spirit that we may live the Orthodox Christian Faith in truth and not just word. Accepting what you say as true, what is your solution? How do you propose to re-evangelize the laity when three of the five bishops you have served under were both ethno-centric and disinterested in outreach and spiritual renewal? Calling for all of the canonical bishops in the US to constitute themselves as a synod and to elect their head, making the Church in the US autocephalous, may not be a magic bullet. As things stand now, it may be more like a “Hail Mary pass”. The demographics are dire. If we continue to serve only OUR PEOPLE the Church in the US is will not survive. Many of our faithful are suffering from the “disease” of spiritual atrophy (as you noted in your post). Others are being attracted to the fundamentalism of the Ephraimite monastery movement. Many others are leaving the Orthodox church every day, either to join other Churches or joining the “Nones” in the secular precincts. So, what is your plan? Could you and other like-minded clergy make a difference if you were supported by bishops who understood that they are responsible for the souls of those entrusted to them here where we all live, rather than to far-away Synods? The definition of insanity is continuing to do the same thing and expecting a different result. We have 14 “ethnic” jurisdictions all of which (except for the OCA) depend upon Synods in Istanbul, Damascus, Belgrade, Bucharest, Sofia, Athens, Moscow [who am I missing?] to send Bishops to serve the Orthodox faithful here in the US. How has this worked out so far? Mr. Matsoukas did not claim that Canonical Jurisdictional Unity will solve the spiritual “disease” that you have diagnosed to be affecting the Metropolitans, Archbishops, Bishops, Clergy and laity in the US. I agree with him, however, that this is a necessary step that must be taken if the rest of the problems are to be addressed and solved. 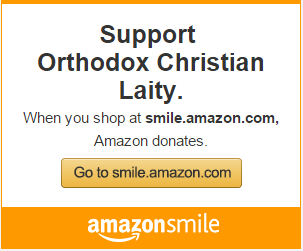 I will not review the canonical, logistical, practical and common-sense reasons for a single, united Orthodox Church in the US. Those are well known. 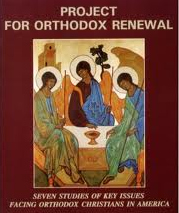 OCL has been advocating for Spiritual Renewal, Orthodox Unity and Accountability and Transparency in Church governance for about 35 years. Others have been calling for this for many years before OCL was founded. I have heard more than one Hierarch point to the fact that the Church has survived centuries of persecutions, as though that will guarantee its survival in the US. While it can be said that the Orthodox Church in Greece survived under 400 years of Ottoman Rule, would it have survived if there had been 14 Orthodox “jurisdictions” in Greece? Would the Orthodox Church have survived in Russia under Communist rule, if there had been 14 Orthodox “jurisdictions” in Russia? How about Egypt? Syria? Serbia? Bulgaria? Romania? Albania? A united autocephalous Orthodox Church in the US under a single synod of canonical bishops may not be a magic bullet.. and a desperate Hail Mary Pass may be dropped or fumbled in the End Zone, but if our bishops were to unite under a single synod, bringing the Orthodox Church in the US into canonical order, the prayers of the faithful might be heard by the Holy Spirit which is present everywhere and fills all things, and that Synod might be moved to elevate worthy individuals as Hierarchs, who would support priests like you and others who can bring us back from the precipice we are facing today. If anyone has a better plan, this Forum is the appropriate place to present it. We’re here and we do. Yes, we’re flawed. God mitigates shortcomings, because if perfection were required, the Church would have succumbed to the “gates of hell” a very long time ago. Our issues are no more insurmountable than the problems faced by the rest of the Orthodox world. Who can argue with this?